WikiBranding: Micro financing a car. Some ideas are brilliant in their simplicity. 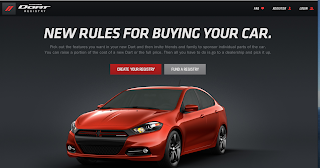 The Dodge Dart Registry is one of those ideas. 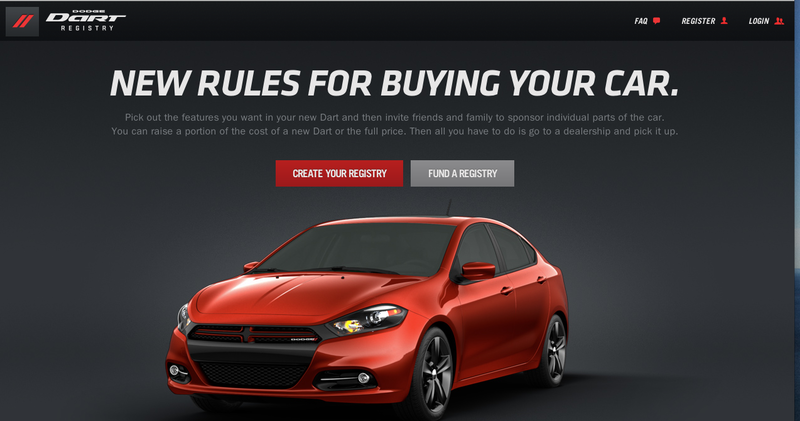 The website allows prospective Dart buyers to get friends and relatives to help fund the car. It elegantly intersects several existing behaviors and cultural dynamics: It is grounded in the familiar behavior of gift registries, then adds new dynamics from the worlds of microfinancing and social graphs. Buyers start by configuring the car. Then they set a funding goal. Finally, they push the registry out to friends and family who can choose to fund the wheels, sound system, leather upgrade, etc. Instead of innovating new message to tell me why I want a Dart, Dodge opted to innovate new ways to make it easy and fun to buy a Dart. 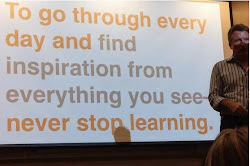 Proof that the path to getting to a new answer often starts with asking a different question.